Since before this Ramadhan, Grand Indonesia Shopping Town (GIST) and several tenants have been organizing an invitation for food bloggers to participate their Iftar program. Those tenants are Tairyo, Jun Njan, and Katsusei but it wasn’t much of a choice actually since GIST assigned the food bloggers according to the date they signed in for joining the program. Amongst the already established tenants like Jun Njan and Katsusei, Tairyo is probably the youngest and therefore the mission to untangle the mystery behind it was privileged to those who enroll earlier. Tairyo may not look much like the usual Japanese restaurant you’d expect. First of all, it’s a teppanyaki restaurant and as the facts unraveled it’s not a native Japanese franchise nor locally tailored but it came from China Mainland. 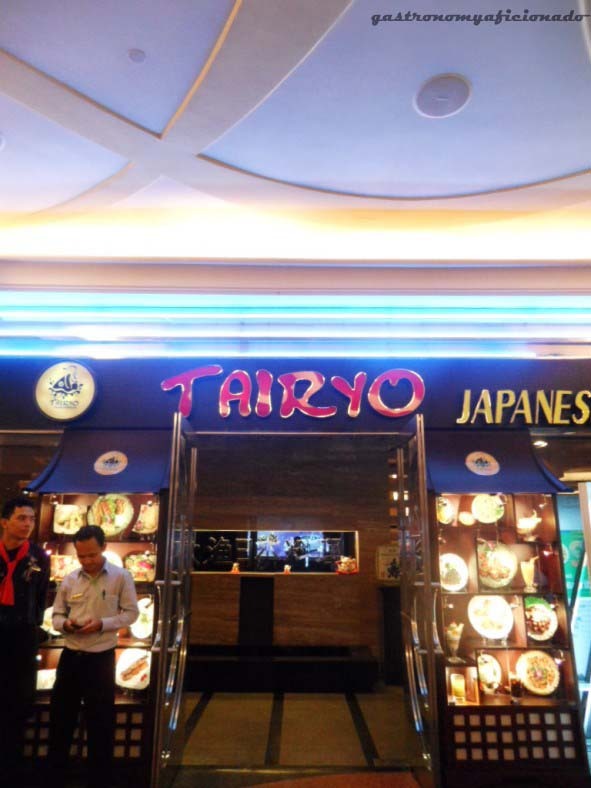 Said to have around 80 outlets in China, finally Tairyo set foot in Jakarta and hereby representing the first Indonesian outlet. Usually there’s a certain degree of elegance and privacy in authentic Japanese restaurants, but please do not make it similar with fast food chain like Yoshinoya for instance. Of course Tairyo has its own private dining rooms but everything seemed so spacious and open here owing perhaps mostly its teppanyaki theme. There’s nothing wrong about it anyway. Teppanyaki itself is a high-spirited way of serving dishes especially when you see those utensils clashing with each other, fresh display of the ingredients, the attractive cooking style like those in Benihana, and how teppanyaki tempts the patrons’ appetite with all its charm of sight and smell. It’s indeed a really beautiful way to deliver the goodness of food! The difference however came from the variation of the dishes there. For example, teppanyaki usually involves vegetables, chicken, beef, and fishes all cooked in the usual way using the same oil, pepper, salt, soy sauce, etc. Here in Tairyo, they serve those ingredients in quite an unusual way. Before that part, we started with a small appetizer of prawn salad and prawn cutlets. 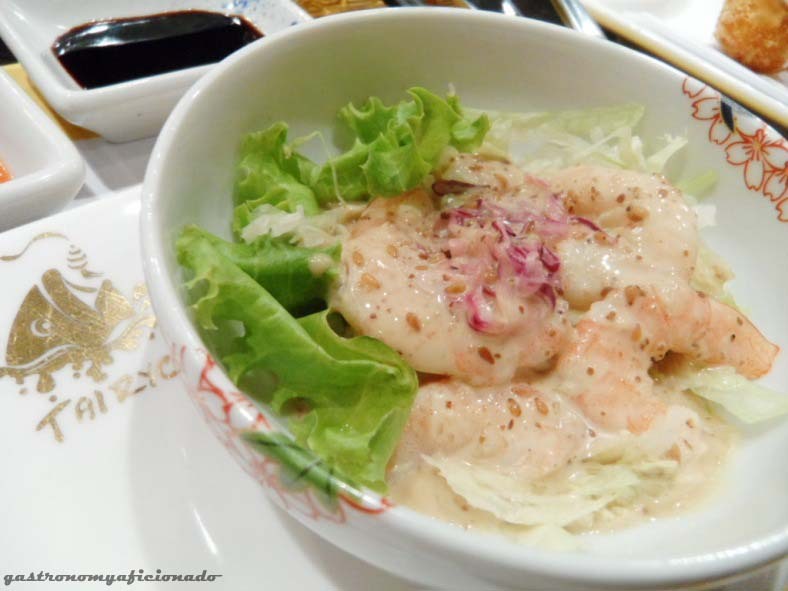 The salad was quite tempting especially with the sour and savory sauce ala Tairyo. 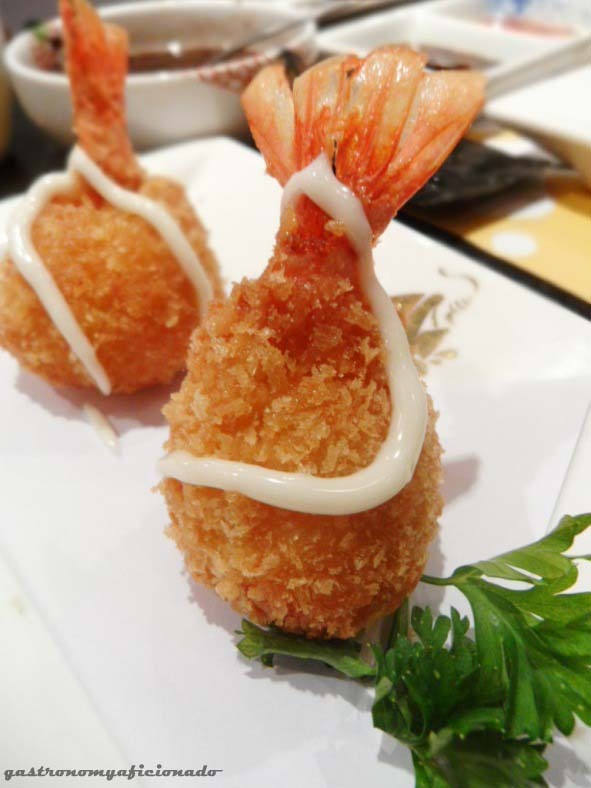 The cutlets were promising with the golden crispiness, mayo and the fulfilling content of prawns with cheese but one participant complained that her prawn was not thoroughly cleaned therefore leaving some prawn filth behind. Again this is an embarrassing thing but it’s still considered as minor flaw. The best thing she can do was actually to break a plate and start shouting and hollering, refusing any kind of compensation but really, this is Indonesia and there’s no need for such fuss. 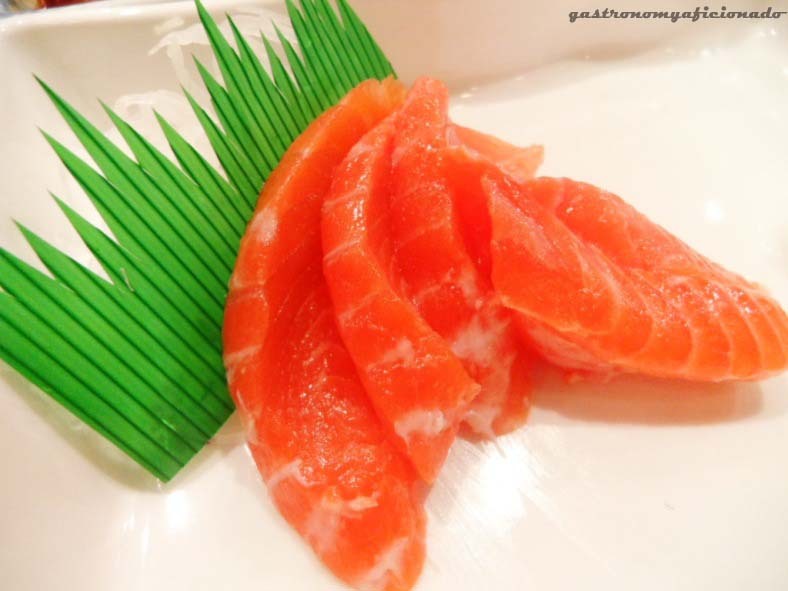 The sashimi class was proved to be quite interesting and Tairyo served us the salmon belly which was quite fresh but nothing really special about it since we were kept a bit long before the chef cook us the teppanyaki. Straight to the teppan, it was a parade of meat and sinful dishes especially because it’s Ramadhan. Well, not exactly. For devout Muslim, it’s a constant chastity all year but after several courses vegetables, tasty short ribs, and a distasteful enoki wrapped with beef, finally it’s time to test it with the oysters. 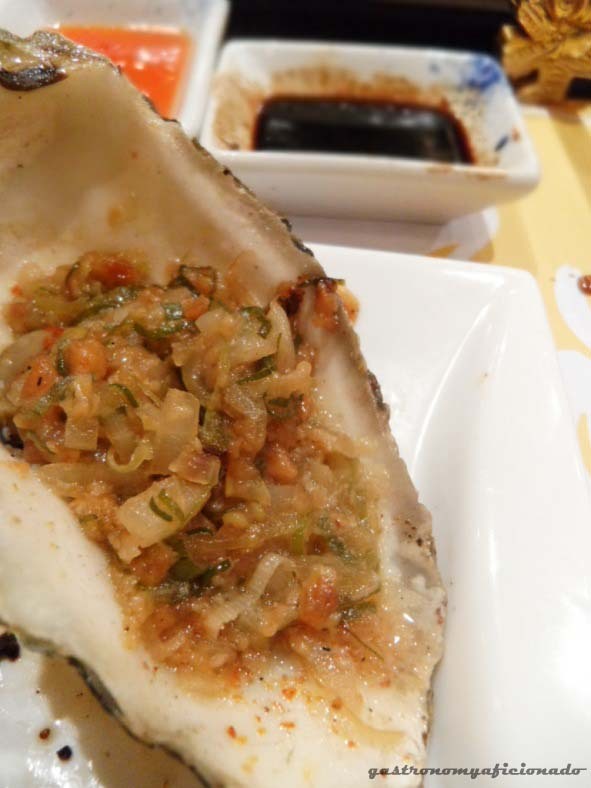 The chef heavily flavored the oysters using garlic sauce and everything he can put on the oysters before demonstrating how he can set the teppan alight by pouring brandy all over them! It’s quite a sight to see but I can’t really eat something alcoholic like that and turns out to be a good call since other bloggers claimed that the oysters were way too salty! Other courses such as the usual gindara and garlic fried rice yet the unusual such as lamb chop and ox tongue were not really that special until we finally caught up with something really good before the finale. It’s the chicken! So surprisingly, the cheapest among all, the poultry section represented by the chickens prove themselves worthy! The finale took place after a long delay because of the quite exciting sushi making competition and apparently this dessert is their pride and soul. It was the banana flambé and they’re replaying again like when they made the oysters. 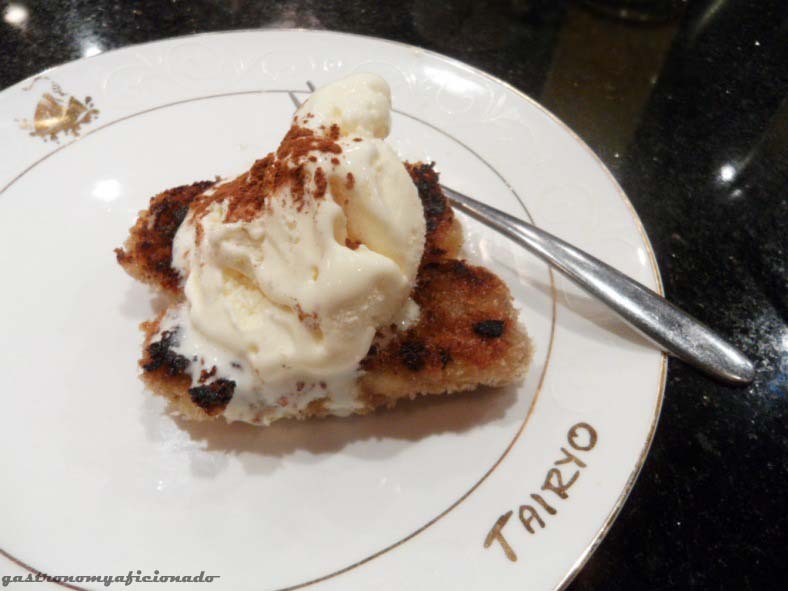 Thanks to, I bet, the Diamond vanilla ice cream and the cinnamon sprinkles for making it special. In the end, it was probably the lengthiest food bloggers dinner I have ever attended ended around almost 10 pm and it was a luxurious treat from Tairyo despite the flaws. All-you-can-eat option may be a bit tricky for you since frequent pauses while waiting for your food may prove to be too much and ensure early full stomach. It’s an adventure as well as a risky venture for you but still worth the try since teppanyaki has always been a great option for you and your family dinner. Price: IDR 129,000+/person (lunch), IDR 149,000+/person (dinner), IDR 250,000 (all day) – all-you-can-eat with different varieties depending on the package. Children under 5 years old eat for free.